On days when you just can't even, hats are probably your BFF. 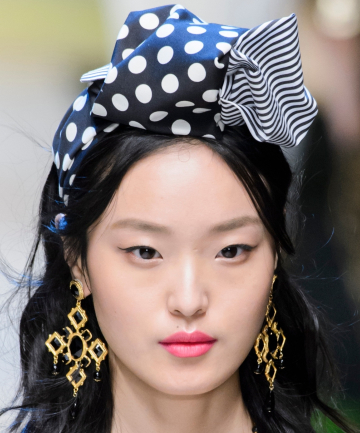 We're not going to knock your go-to baseball cap or bucket hat — we totally understand their bad-hair-day appeal — but we'd like to suggest an additional hair accessory for your beauty emergency: headscarves. Headscarves offer the cloaking abilities of a hat, but are more versatile. There are umpteen ways to tie a scarf around your head and the vast majority of headscarf hairstyles require minimal effort, which makes them a great option on rushed, lazy, crazy days. And with a few styling tweaks, a headscarf or wrap can be worn everywhere from brunch to the office or post-work drinks. It really will save the day again and again. Read on for 14 easy headscarf hairstyles that are no-fuss but completely presentable. Bad hair days — we've all been there. Lucky for you, this season's hottest hair accessory is the headscarf, the simplest solution for quick and easy hairstyles since the bobby pin. The best part: You don't have to go out and buy a ton of headscarves (unless you want to). Chances are, you already have some sort of scarf, bandana or wrap that you can use to hide your frizzies, add polish to your updo or give your outfit a retro vibe.